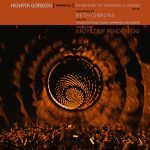 As she sings Henryk Górecki's Third Symphony, "Beth Gibbons’ voice, urging contralto into soprano, shudders in a coarse fragility, where the ornament of opera-hall vibrato collapses into the weakness of voicing more pain than can be voiced." This is according to Tiny Mix Tapes, which has a longform feature on the piece and Gibbons' new rendition. "Although death hovers around this symphony as its shadow," writes Evan Coral, "the promise of resurrection is so near to the work’s pain that it lends it its particular lightness, its ambivalence between sublimity and suffering." Intrigued? Read the full feature here and download the LP from our website.